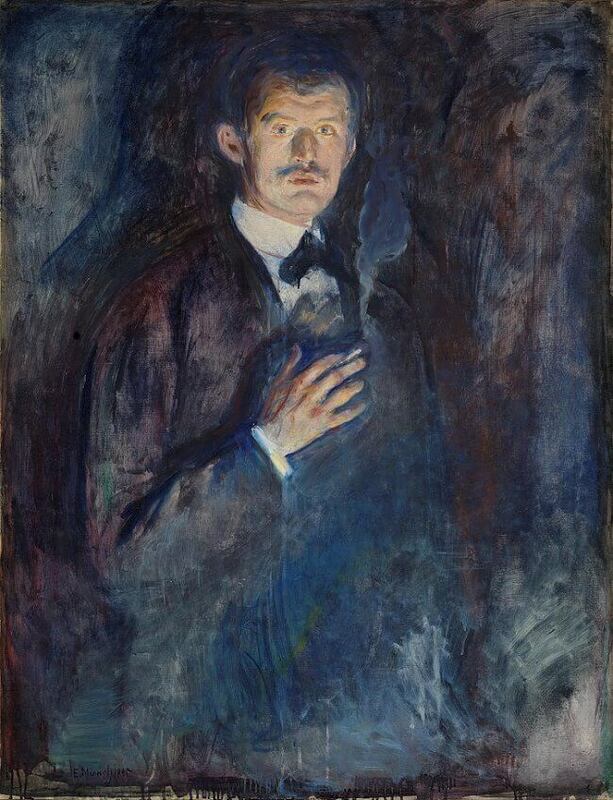 Painted in 1895, when Munch was 32 years old, Self-Portrait with Cigarette is loaded with subtle contradictions. Lacking an identifiable environment and depicting the artist viewed frontally and slightly from below, the self-portrait represents Munch as a man directly engaging his viewer yet distanced from the world. Lit theatrically from below, his face and his right hand stand out in sharp relief against blue background in a manner that is, as one of his critics noted, related to Rembrandt. The artist's face and hands are conspicuously emphasised and seem almost luminous against the dark, unarticulated background. For an artist, these parts of the body are especially significant. At the centre of the composition, one hand is raised to chest height, as if held to the heart. 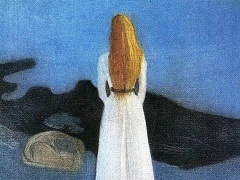 Although the artist seems to be gazing intensely at the viewer, he is looking no less into himself and his world. The artist is illuminated from below and together with the diffuse background and the smoke from the cigarette, this lends the picture a hint of mystery.